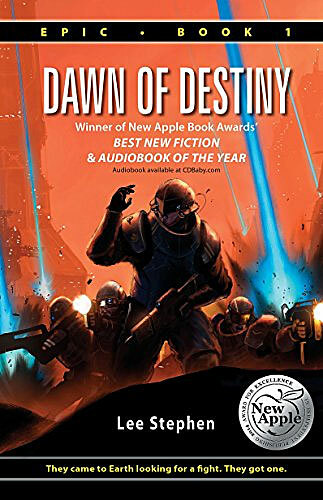 Dawn of Destiny by Lee Stephen book review: A captivating story about a planet invasion war adventure and a man following a divine quest. This book is a planet invasion war adventure of a man that follows a divine mission. A story that will captivate you until the last page. The year is 0011.NE. Humanity is under assault. Hostile forces from other planets have come to Earth. Their motivations are unknown. Their objectives, a mystery. In the face of the extraterrestrial threat, a global military force named the Earth Defense Network, EDEN, has been formed. Dawn of Destiny by Lee Stephen begins with the story of Scott Remington, a new graduate from EDEN Academy. It is the first episode in an epic that will carry him to the ends of the Earth. A challenge to the beliefs he clings to as he faces a purpose he can barely understand. Because, for Scott, war is more than a job. It is the spot to where God has led him; His fate. Only one thing remains. Is it a place he’s willing to go? Some men join the war for glory. Some people go to war to escape their reality. For Scott Remington, war is entirely different. It is faith. It is a vocation. It is destiny. Leaving everything behind, he embarks on a quest of faith into a battle he can barely understand. This is his story. This is his war. This is only the beginning. Raised in the Cajun country, Lee Stephen spent his childhood paddling pirogues through the marshes of South Louisiana, a form of escape through which he would feed to the worlds of the imagination, strange creatures, and epic journeys. 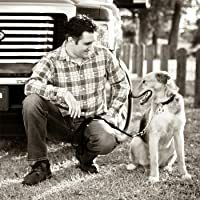 A graduate of Louisiana College in Pineville, Lee now spends time every day delving into the world of Epic, the science-fiction series that has come to define him as a writer and producer. Along with his family, the author has made it a mission to create a series that is unique in its genre, full of humanity and faith. Dawn of Destiny by Lee Stephen is a very well-written piece of work. Entertaining from start to end, there is no way you will put it down, before the last page. The author creates characters that are full of life, and you quickly get connected to them, cheering for them and suffering with them during their quest to save Earth from the alien invasion. Although he does not fully understand why, Scott Remington, a regular guy, thinks God has a purpose for his life and that his destiny is to be on the front of this war, defending our planet. The story starts with him arriving in Richmond, Virginia after leaving the EDEN Academy and meeting his future colleagues in the fight against the aliens. While attending the academy, Scott had met Nicole. They fell in love and got engaged. But he had to leave her to fulfill what he thought was a calling from God; WAR. His first real battle happens in Chicago and, after succeeding in that fight, command transfers their platoon to Novosibirsk in Russia, under the command of general Thoor. The commander is a very powerful person that also leads a secret parallel force known as the Nightmen. They are assigned to attack an alien base established in Siberia. Using his judgment, general Thoor drives them to victory in that battle, but with massive losses in personnel. Every page turned is a new adventure, and you will most certainly read this book at the edge of your seat. I recommend this book to any science fiction lover that appreciates a smooth and flowing reading, that even children can follow. 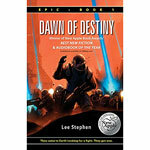 Please leave a comment about this Dawn of Destiny by Lee Stephen book review. Oh boy, this looks like a promising book for my next read. I am a big fan of science fiction stories. Especially when it starts with an alien race invading Earth. Another book for my wishlist! Thank you for this review and congratulations for the great work. Thanks for being such a loyal reader. We enjoy your comments very much. Cheers!